When to go to the doctor? When will the nail change color and become an unnatural brown shade? Or when the nail becomes loose and thin? Or maybe these symptoms are not a fungal infection at all, but simply the result of a strong compression of the nails or an injury? It will help to identify the nail fungus on the nails photo: carefully consider your nail and compare with the photos. By the way, if you suspect a fungus is not on the nail, and on the skin of the legs, hands or any part of the body, then you are here . 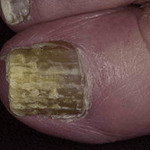 To dispel doubts about the presence or absence of the fungus, we suggest finding out what the nail fungus looks like at different stages. In this photo, the nail fungus began to hit the edges of the nail bed. Take a closer look: the lateral edges of the nail and its free edge have acquired a yellowish color, and the plate itself has become opaque (the base of the nail is no longer translucent). Sometimes there is a gap between the nail plate and the bed, where fungi pathogens and other microbes live. 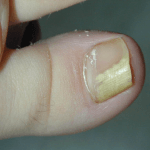 Doctors call this lesion the distal-lateral form of nail fungus. 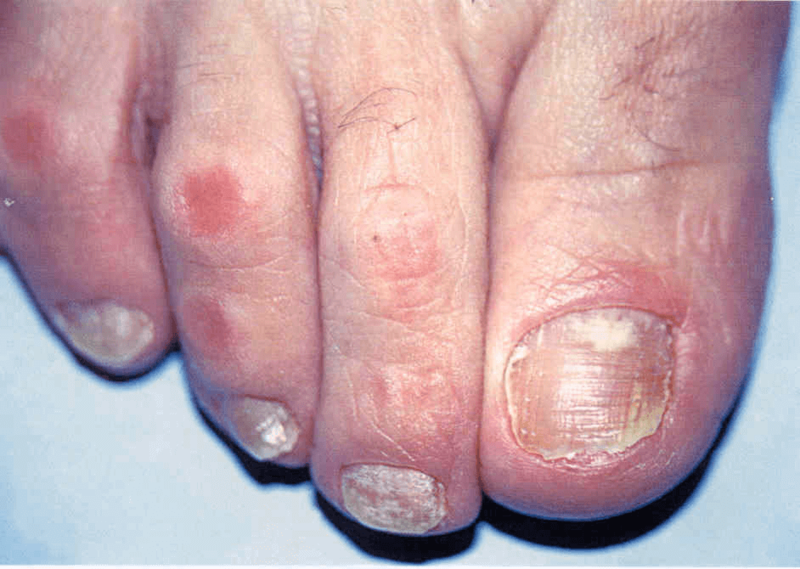 The following photo shows the initial stage of the nail fungus of the same form, but already with subungual hyperkeratosis. 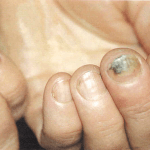 Hyperkeratosis is a phenomenon when the nail reacts to the fungus by increased keratinization of the nail bed. The deeper the fungus penetrates the nail plate, the thicker the nail becomes. 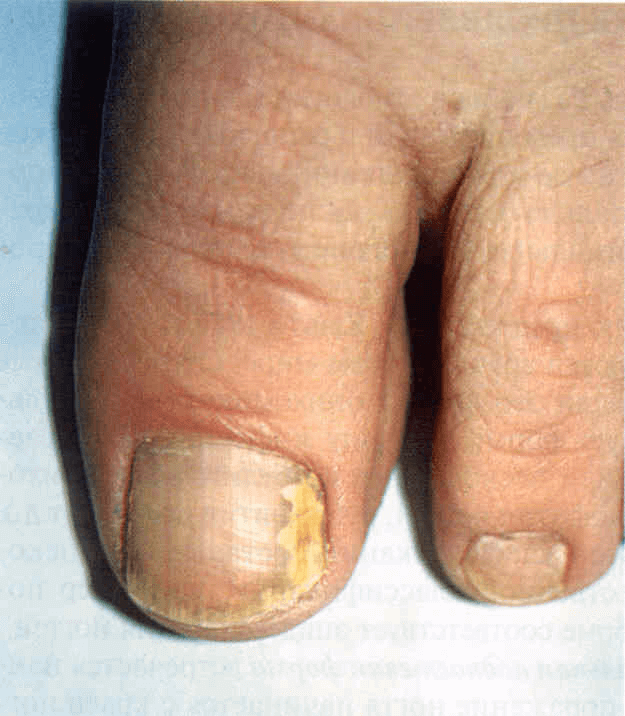 The final stage of the distal-lateral form - the defeat of the entire nail, the involvement in the process of the matrix (the place where the nail begins to grow), nail dystrophy. Loose and rough nail plate, which is easily exposed by scraping, speaks about the superficiality of the lesion. This form is found only on the nails of the feet (more often on the 1st finger, less often on the 5th). The next form of fungal infection is proximal subungual. Characterized by the defeat of the red roller (the tissue surrounding the nail). Then the roller swells, becomes shiny, and then changes shape. The result - the separation of the cuticle from the nail. Next begin dystrophic changes in the nail plate. They begin with the appearance of irregularities resembling grooves on the nail. In advanced cases, the plate disappears. The total dystrophic form is the most advanced version of the fungal infection ( more ) of the proximal or distal form. The photo clearly shows that the nail is uneven, thickened, has a gray color. The main feature is the complete or partial destruction of the nail plate. How do different nails affect nails? Hopefully, there are no questions left on the symptoms that can be determined visually. But it would not be bad to determine the type of fungus that is responsible for the suffering of the nails and feet. This is primarily important for the selection of an adequate drug for treating an infection, because often the active substance of a drug copes with only one fungus. If you need to identify the fungus on the feet, on the body, on the face or on the head, then click here. The most common are the following types of nail fungi (photo to help). 1. Yeast nail fungus . These pathogens belong to the genus Candida. Damage by them is characterized by thinning of the nail, its yellowing, gradual lagging behind the bed. In the running cases, the nail plate acquires a brown color and almost completely exfoliates. Not only the nail suffers, but also the roller: it thickens, swells and becomes red. 2. Dermatophyte. If the nail is attacked with Trichophyton spp., Microsporum spp. and Epidermophyton spp, yellow / gray streaks or spots first appear. Then the edge of the nail begins to turn yellow and gradually moves away from the nail bed. The more spots, the higher the degree of infection. 3. Mold fungus. It is cured easier than others, because it does not penetrate deep into the nail. 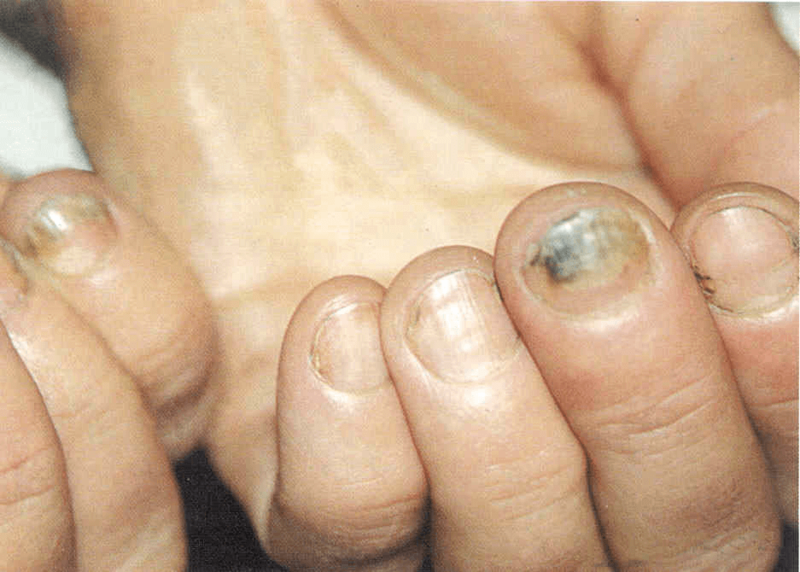 The main sign of infection is a change in the color of the nail plates. They can become green, black, brown, etc. Also, mold fungi can provoke the appearance of black spots and dots on the nails. 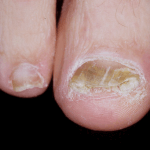 The pathogens of a fungal infection eventually migrate from the nails to the foot (the fungus of the foot and the nails in the photo), and besides the itching, cracking of the skin of a person begins to bother with pain when walking. If you observe the above symptoms, then immediately contact your dermatologist. The sooner the treatment begins, the faster the fungus will leave the feet and nails alone. Particularly attentive should be the parents of small children, in whom the fungus also occurs, although not as often as in adults. 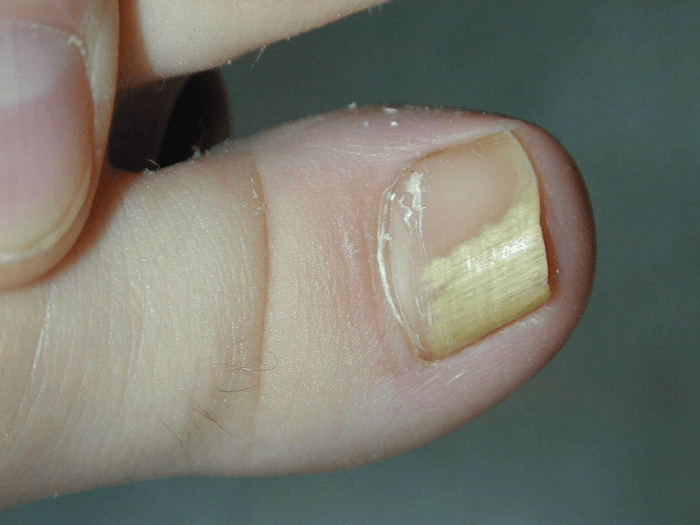 In the photo of the nail fungus in children, it can be seen that it flows according to the fungus in adults, but the child may also be disturbed by ulcers, erosion, vesicles, itching and reddened skin. Frequent occurrence and burning when moving. You should not try to cure the fungus yourself. As already noted, the drugs do not cope with all types of pathogens of the fungal infection, so the expensive medication purchased from a pharmacy may be useless. 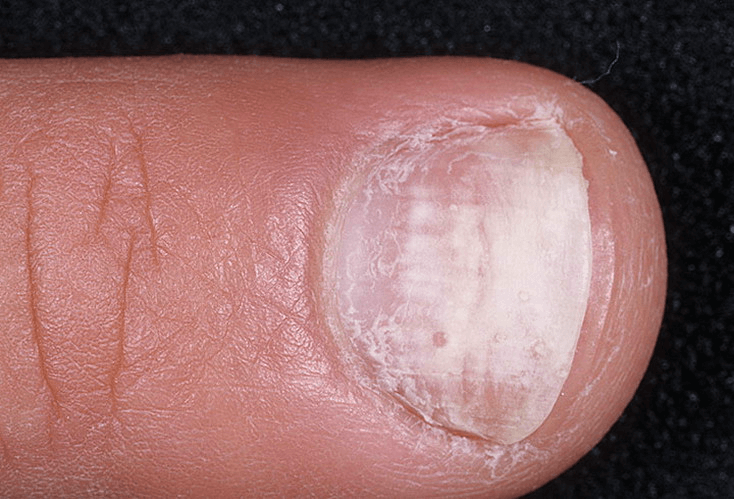 In the photo of the nail fungus above it can be seen that at any stage of the fungal infection, local or systemic treatment is indispensable. In addition, it will be necessary to eliminate the factors that contributed to the appearance of the fungus. 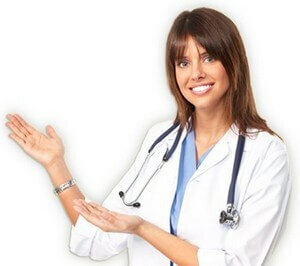 Sign up with a doctor - the first thing you should do after you are convinced of the presence of the disease. It is the specialist who will best select the drugs, prescribe the course of treatment and control the deliverance from the disease. As a rule, the doctor prescribes a local drug against mycoses. Read "Review of effective drugs." In advanced cases, you may also need pills , but they are sold, usually with a prescription. It must be remembered that the tablets have some toxicity and their use is justified only in some cases. Read more about pills. Another option, well-proven for the nail plate, is lacquer. Read more about varnishes ..
Well, traditional medicine , despite its popularity, is extremely ineffective. It usually leads from the early stages to dystrophic forms (see illustrations). "Grandma's" recipes are for informational purposes only. Very useful, informative article! Thanks for the information! What doctor to contact in case of detection of the disease? Thickening of the nail, the rapid formation of corns and dry corns, can be a manifestation of the fungus? Feet regularly process. My, I clean ... Everything is as it should be. Change shoes once a season. For next season, buy new shoes. The treatment is much more expensive. And go to the dermatologist. I also have nail thickening on some toes. But I looked at the pictures. In my opinion, this is still not a fungus. Maybe I walk a lot? And shoes are not always comfortable? Thanks to Fukorcin, I got rid of the fungus from the Tula pharmaceutical factory. It is worth a penny, about 40-50 rubles a large bottle. Fukortsin some world means and in the feast and the world! It helps with cuts in the skin, treating them from chickenpox pimples. In general, in our home medicine cabinet there is this tool! How exactly did you get rid of? Say, pzhlt, and the liquid from under the nail, how can a sucker be released during the fungus? When the fungus is generally extremely rare, something stands out, only in the most neglected cases. Most likely it is a matter of injury or it is a weeping dermatitis, unfortunately, without examination it is difficult to say. Tell me please: at night the heels are very itchy - can it be a fungus? 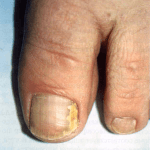 The nail on the second toe of the second toe has a seal and is yellowish in color. Most likely it is a fungus. Fortunately, it is much easier to treat the skin than the nail. Buy ointment to choose from - Clotrimazole, Teribnafine, Miconazole and apply according to the instructions. This is usually 2 times a day for 2-3 weeks. When all the symptoms have passed, you must continue to apply, do not quit and do not interrupt the treatment. Also, before starting treatment, it is necessary to remove excess cornified skin with pumice. Please tell me, on the middle finger, a vertical white strip appeared on the nail and the nail breaks into two halves along this strip during growth. The nails themselves are pink, not wavy horizontally. Maybe it's a fungus? Thank! It is unlikely, rather, it speaks of systemic problems of the body, you need to see a general practitioner, do not pull. Tell me please, the nail is twisted into a tube, and the thumb nail is thickened and yellow, when I cut it, a cavity forms in the nail, and there’s nothing else there, it is poured out like chips, is it a fungus? Probably, it is still a fungus, I have spread to other nails. There may be a nail wart. It is impossible to grow nails. 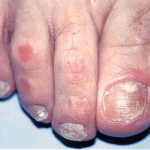 Hello, a 12-year-old child has large symmetrical purple-brown spots on large toenails. Is that it? Should I go to the doctor? If they are directly symmetrical, then the first thing that suggests is cramped shoes. But the brown tint can talk about systemic problems in the body, so YES, you need to go to the doctor. Unfortunately, in dermatology, it is rarely possible to make a diagnosis without examination. If the nails, which were treated for some time by Exoderil, were handed over, then this explains the negative analysis, and the fact that they pass from these drops is confirmed by the fungus. Just need a more thorough treatment, with the use of pills. But there are other diseases of the skin and nails, such as autoimmune. One advice, you need to go to the reception, to describe the situation and to ensure that the doctor gave some result. If one doctor cannot help, refer to the other, third ..
Hello! Tell me please, my husband has two blue toes on his thumbnails, never nailed them. Is that a fungus? Perhaps the new tight shoes affected. When you put it on, it does not feel, and after wearing bruises appear. But maybe a fungus, Candida can manifest itself in blue, you need a checkup at the varcha. I had the following situation. For quite a long time, the skin on the tips of the fingers near the nails is dry, it cracks and peels off. And in recent days I noticed that the surface of the nail has become less smooth. On the ring finger of his left hand on the nail appeared two longitudinal strips, similar to cracks. If you look at the light on the thumbnail of the right hand, you can see frequent longitudinal stripes that are noticeable even by touch. Every day I notice that the same longitudinal stripes gradually appear on the nails of other fingers, even on the big toes. What could it be? And what to do in this case? Maybe this is a fungus? The fact is that for six months I have been treating mycosis of the scalp with Tsinovit shampoo, which I was prescribed by a private dermatologist. Is it possible that the fungus has passed on the nails of the hands? Maybe you had to wear gloves while washing your hair and applying a therapeutic shampoo? And another such question does not give me peace. The doctor, besides Tsinovit shampoo, prescribed Itrungar capsules to drink 2 weeks, I have already drunk it and more than once. And in the instructions for this drug is not written a word about the treatment of mycosis of the scalp. The same applies to other drugs, based on itraconazole. Terbinafine and its analogs are written in black and white: mycosis of the scalp is 4 weeks, but itraconazoles are not. Maybe that's why I can not cure mycosis of the scalp? Since the treatment process has been delayed, I would like to drink a pill a month, in addition to using shampoo. I can't go to the doctor right now. I read that Lamisil tablets help people recover in 1 month, but for me they are very expensive. And the Ukrainian counterpart Terbinafine is a cheap drug and I fear it will be ineffective. Could you advise me something? Yes, itraconazole does not write this, but the matter is in the pathogen, and not in localization. In any case, if he did not fit, you need to drink another. Terbinafin is a good option. Half a year of treatment is not the norm, so shampoo does not help, try another, for example Mycozoral or Nizoral. Changing drugs should help. Take a break of at least 4 weeks between the pill courses. 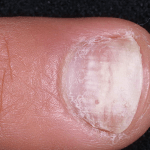 It is possible that on the fingers of the dermatitis, in order to check it is necessary to anoint several days with any glucocortcoid, for example, Prednisolone or Hydrocortisone. If it helps, then most likely the autoimmune reaction is dermatitis or something similar. Just do not get carried away, they can not be constantly used. Tell me, what can mean the longitudinal stripes on the nails of the hands? They do not give me rest. I began to lubricate the nails of the hands with iodine for the night, especially on the day when my head. I want after Zinovita to try using another shampoo. Tell me, please, between the change of shampoos need to take a break and how much? And another important point in the treatment is disinfection. How to effectively disinfect the headdress (I also take a hat, which includes wool with acrylic) and clothes (turtleneck, wool and angora) with mycosis of the scalp. Formidron help? The strips on the nails can talk about any systemic disease, you need to show this to your doctor, for example, to the same dermatologist. You do not need a break, the main thing is to follow the instructions. Good day! I have a nail on my nail, but somehow it is in the middle of the nail and the color is transparent. What can it be? Thanks! There are many reasons for this; you need to see a doctor. 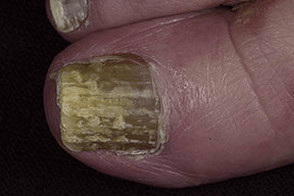 Fukortsin can be used as a treatment for nail fungus? Or skin only? Only if you are not afraid that the nails will remain red, as long as the new ones do not grow, and this is a very long time. Hello. The son has seborrheic dermatitis of the head and affects the area of ​​the nose. Without research, according to the doctor, we use Chemerican tincture. But after a while it’s even worse. Maybe you need to drink pills? What kind? Chemerichna water is used against skin parasites. From seborrheic dermatitis, you need antifungal shampoo, such as Nizoral, Keto Plus, because The most common cause is Malassezia furfur. There may be other problems in the body, for example, if there are problems with digestion, bloating, and loose stools, you must first deal with them. Hello ! I have black stripes on my toes in the nails, what can this be talking about? This may be a lack of any nutrients, and there may be problems with the cardiovascular or digestive system. In any case, you'd better consult a general practitioner or a dermatologist for more accurate advice. Hello. I want to start taking fluconazole since the fungus covers almost all the toenails more on the big toes. In addition, the skin on the chest constantly itches with abundant peeling. The fungus was not detected twice and the zinc ointment did not help. Try 150 mg once a week. If after 4 weeks on the skin the symptoms do not pass, then it is really not a fungus.